One’s back is vulnerable, unless one has a brother. A pack of elemental, engineered executioners, the color of granite and thunder clouds. The Sky Warriors of Fenris. Tomorrow is the grand finale of the Invitational, and we have a very special surprise ready for it. It has been an absolute joy to see and share all the amazing work and it feels good to finally share my entry. Two talented laggards will be featured at a later date. 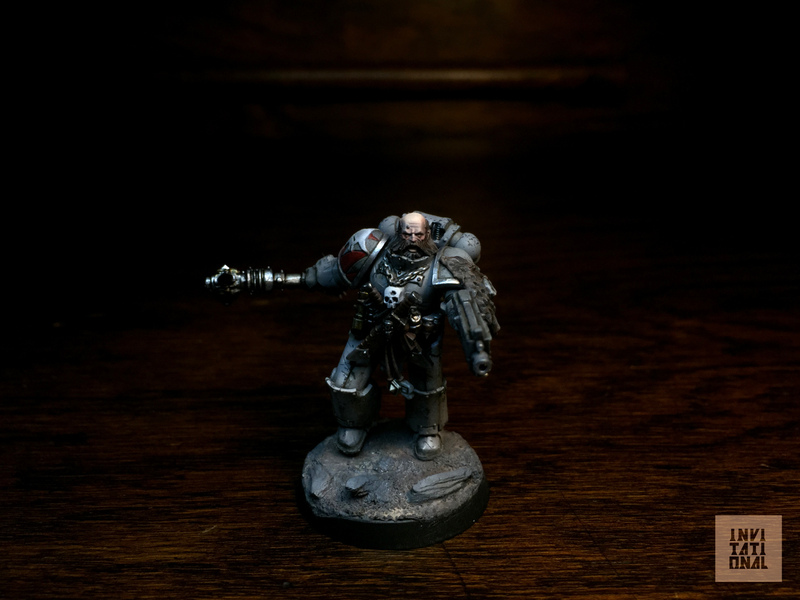 This is how I imagine the Vlka Fenryka, a labour of love, a force of nature so singular that trying to do Inquisitors at this moment in time was not going to fly. At the same time, the Invitational required something special and peer pressure was considerable. What could I do that was special, in this this league of extraordinary modelers, with my own project already so full of Primarchtastic conversions? I decided to go to the beginning. Back to basics. Humble warriors. 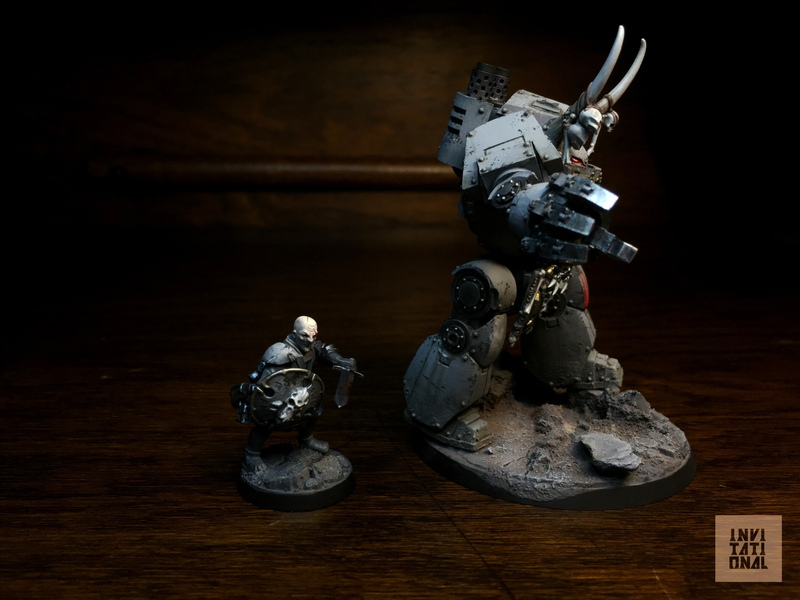 A man, a marine and a dreadnought. A Kaerl, a Sky Warrior and a Living Legend of Fenrys. Or Ranulf, Called Mastodon, Ancient; Thorwald Wintrmaw, The Grey hunter; Unknown Kaerl and a Thunder Wolf for flavor. 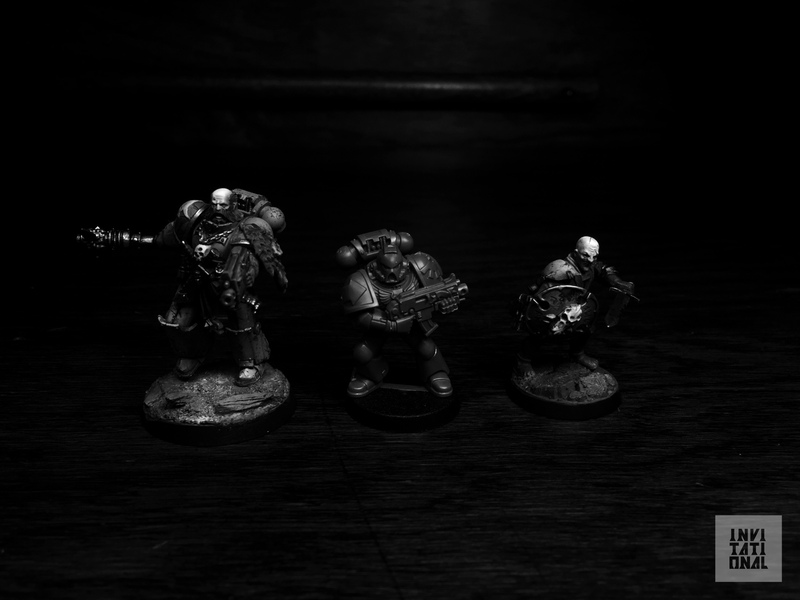 Nothing special, just the heart of the project, the heart of Astartes Imagery. Grey, weather beaten, cold, with a spot of blood. Each model was an opportunity to hone and explore, stretch the palette. I had some specific goals. Introduce and explore new metallics. Gold, Brass and heat or exhaust weathered alloys. Overall I am super excited about the metallics in this project, but up to this date they have been a little monotone with the exception of a hero’s sword or so. I wanted to really understand where these brilliant Scale 75 metallics can go with inks. 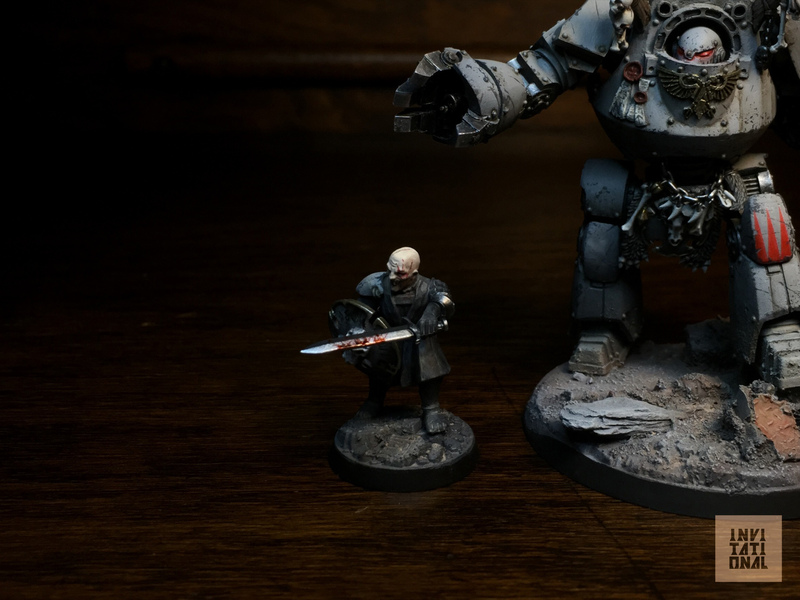 I still found a use for GW mithril, but overall the Scale 75 are hands down the best metallic paints I’ve ever used and much credit goes to that asset. Fine tune the skin tone. You guys saw the daylight photos recently and have a better understanding of the shade. I’ve further improved it with very subtle purple washes, and refined the way I paint hair and beard. Thorwald’s face is the best face I’ve ever painted I think. For the entire project, I’ve used Scale 75 skin paints only. Establish an approach for vehicles. Basically see how the scheme scales up and what adjustments need to be made. I’ve used airbrush as much more of a zenith highlight tool, but aiming for realism. I think a lot of it is lost in the photos because the direction of light is the same as the highlights (obviously) and thus it all blends in, but is very powerful in real life. finally I wanted to explore the oils a little more and largely painted the fur of the wolf with oil paints, and am encouraged. Very smooth, velvety finish. I will use this on all the wolves. sublime and subtle – so realistic – im a sucker for horns …. Thank you! Simple addition, but I think the horns really gave it so much character. Agreed, the horns are a really nice touch. Love the dread. The sharp red marking on the knee is ace! 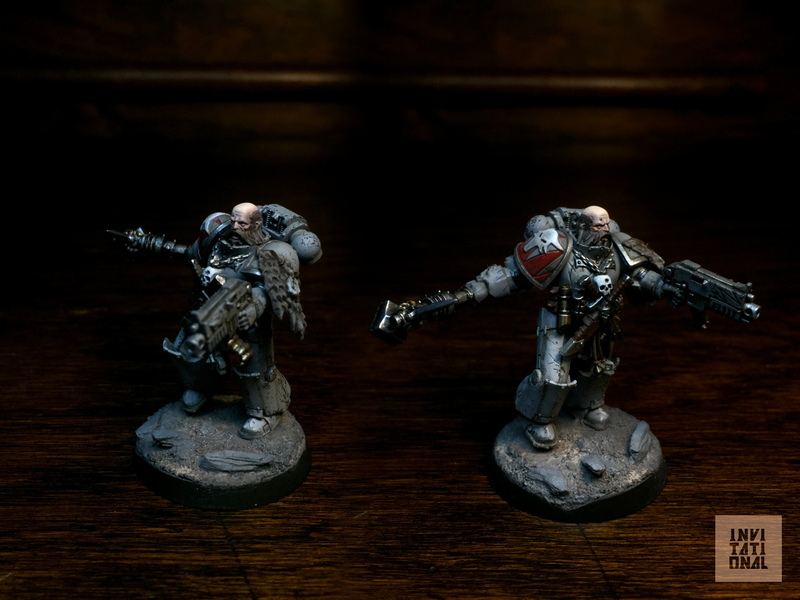 Going back to big marines myself at the moment.. I am still expecting the puritan golden splendour at some point! It’s classic imagery just waiting to be done right. The moment these where done I started painting then 😉 if you’re expecting classic imagery it’s a long wait though. Yes, it’s a golden Inquisitor, but I know it’s going to be very experimental and quite expressive to most people’s taste. The paintwork is so smooth. I can’t get over your faces – so nice. Really great colour scheme! 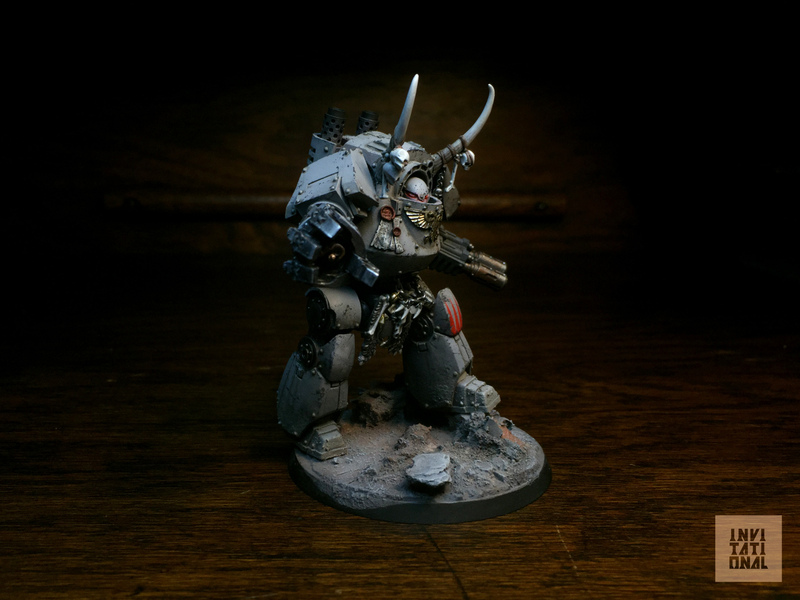 What often bothers me with Space Wolves is that they end up too bright and colourful, with lots of yellows, whites and reds splattered all over the place. Your scheme gives them a more down-to-earth, no-nonsense look (the ONLY look to go for with Wolves, IMHO). So well done, Sir! Thanks man! 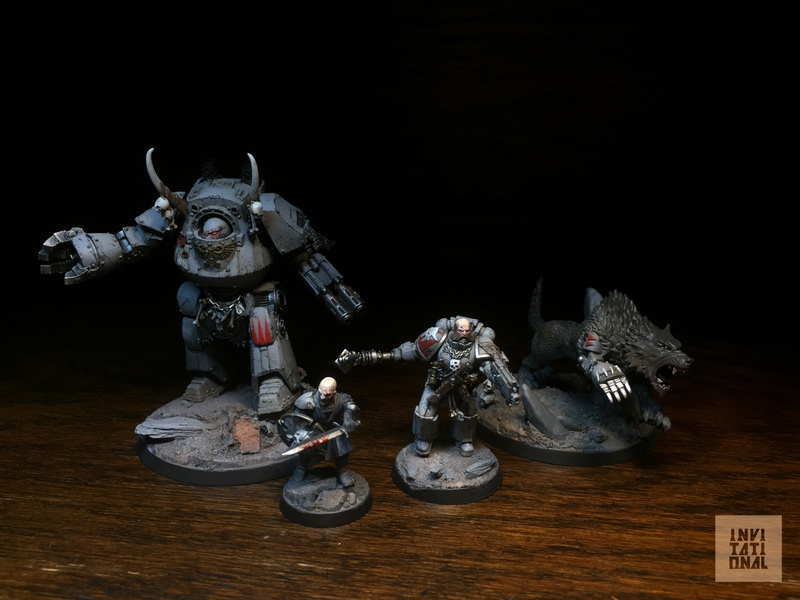 So many Wpace Wolves scheme greys, including Eavy Metal teams are way too blue to my liking too. The northmen are coming, under the moonlight… Their beauty just equal their violence… Your minis are like an Edgar Allan Poe or an Howard Phillips Lovecraft story or a Baudelaire’s text… some kind of poetry melee to some violence. As said before, awesome stuff on those ! Love your big marines and very much an ispiration for me. Very cool and evocative. 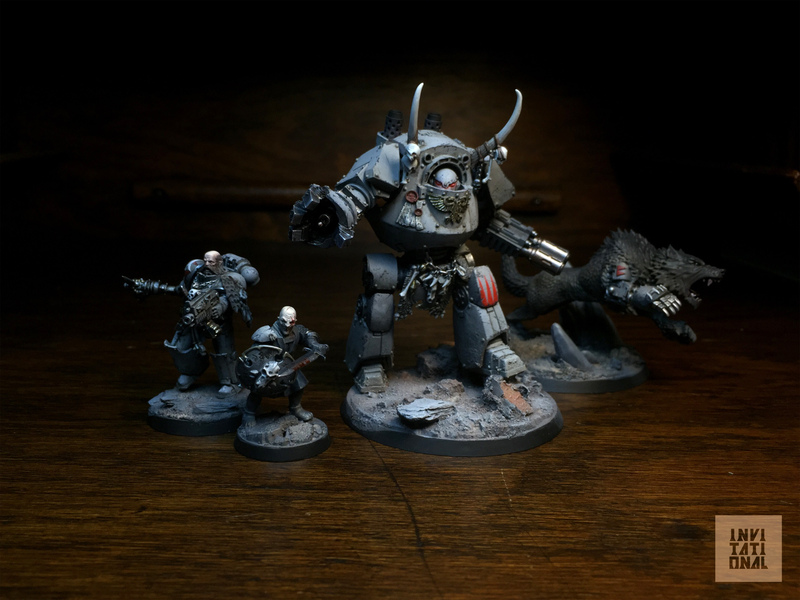 I really dig you very unique take on the wolfs Migs – it turns space vikings into something gritty and interesting and not at all silly (as sadly is often the case). The dread blimmin’ rocks. Good show, sir! the prince’s bairn should be. I am amazed by the conversion work and use of colour, but I also love how the three of them are very different characters, yet are unified so deftly. Thanks Joshsd, that was certainly the goal, so happy to hear it reads that way. Now this makes ones own attempts to do Space Wolves look like the toys they are – utterly bloody stunning Migs! Thank you my friend. Always means a ton coming from you, the guy who defined the Space Wolf model imagery for a decade. I can’t wait to see your wulfen! Beautiful! The face on the grey hunter is really fantastic! And it’s great seeing your armor painting method carried over onto a larger model. I have a feeling that technique will work very well on the flyers and drop pods. Agreed, I do need to get more variation in the grey itself or large flat planes of grey will appear too dull. I am actually well on my way getting there, having most of the primary colors in place for two Storm Wolves and 3 Drop Pods. Fantastic looking entries to the Invitational! I was not expecting to see a Dreadnaught; but what a pleasant surprise! I love the pose and the wicked looking horns. 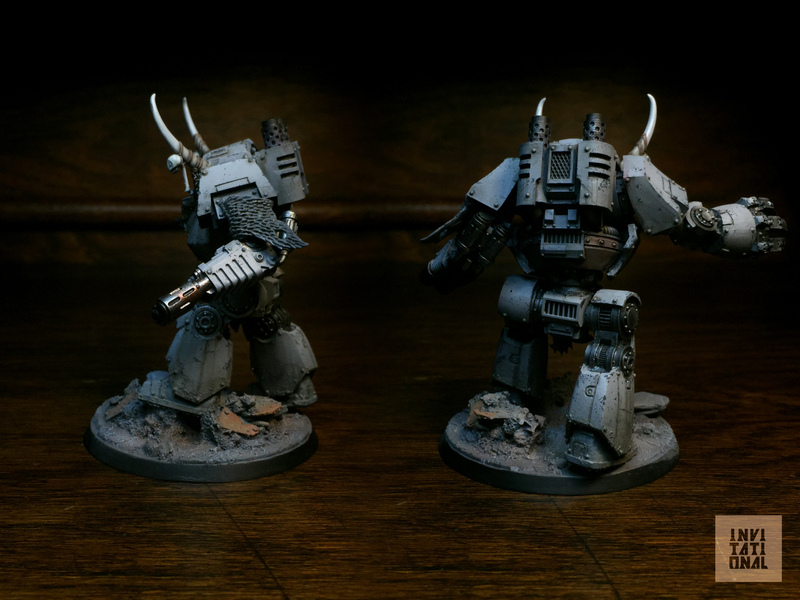 Too often the freedom in assembly afforded by the Contemptor results in over the top and exaggerated poses. The pose on yours is nice and subtle and has a great sense of motion. Your work on the skin tones looks really nice too. I too have been experimenting with using different washes to add subtle purple hues (and reds). The washes can really go a long way with adding life and complexity to a face. I am intrigued with the Scale75 metallic paints (I had never heard of them). I love the metallics one all of your Sky Warriors. They have a reserved and realistic look to them. I will have to look into getting some of them. Metallics can be hard to get right. Keep up the great work! I look forward to seeing what you do with the vehicles for the force. Thanks Adam! I’ve always used washes on the skins – just that I make strong restrictions with each of the new palette’s I pick, and one with this project was to not use any blue. So purple is technically cheating, but so subtle, and also so powerful that I will forgive myself. Skillful artistry. My favourite is the Kaerl, Unknown; his expression, the movement… he radiates directed ferocity barely held-in-check. Selfishly, I think a step-by-step tutorial would be fascinating reading, Migs. I really like these guys, they scream space puppies and yet in a subtle, understated way with just a few choice pelts and totems, and none of that silly hairstyling that would put a trollslayer to shame! LOL. While I think tru-scale marines are far too much work for my liking, the ones on show here look fantastic and are a testament to what a well thought out and planned model can be.